Is that the broken record you hear playing in your head? Are you quick to put yourself down and beat yourself up with every little mistake you make? Do you feel like God is mad at you most of the time, and if you could just do a little bit more, then He would like you? Do you like yourself? It's time for you to stop being mad at you. Jesus came to give you rightness. No matter how much wrongness the devil tries to throw your way, you already have unconditional acceptance and love through Christ's sacrifice. Through this timeless teaching from Joyce, learn how to stop being mad at yourself and enter into a new life of peace and happiness. You can begin to love yourself in a balanced, God-approved way - start today! 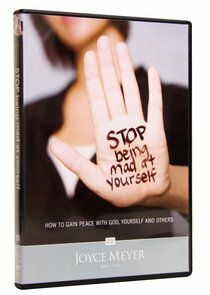 About "Stop Being Mad At Yourself (60 Mins)"